DNG Maxwell, Heaslip & Leonard is offering to the market this most impressive one bedroom, first floor, apartment in the landmark Estoria House in Nile Lodge, Lower Salthill. 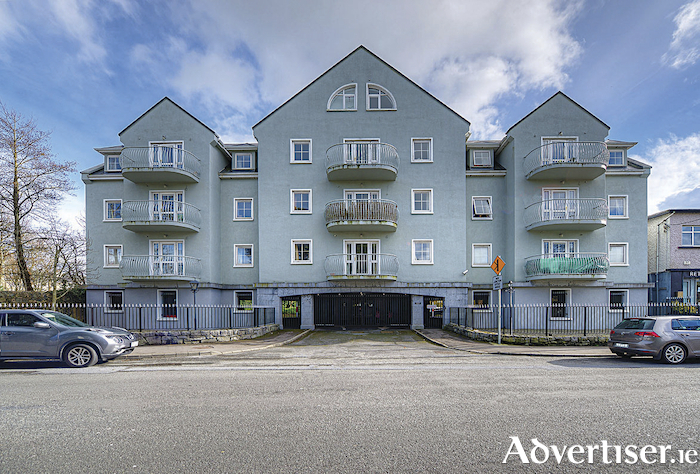 Ideally located within walking distance of all amenities including shops, restaurants, cafes, and hotels, this apartment is also only a short walk from the beautiful Salthill Promenade and Galway city centre. It is also within walking distance or a short cycle of both NUIG and UHG. Impeccably finished, this owner-occupied residence comprises approximately 461sq ft of bright, spacious, living accommodation, including entrance hall, bathroom, open plan living/kitchen with a communal maintained balcony to the rear, and a double bedroom. Presented in pristine condition, the property comes with the added benefit of fully secured private parking. According to selling agent Kyle O’Brien MIPAV: “Given the central location of this property and its proximity to NUIG, UHG, and Galway city centre, I feel that this offers an ideal opportunity for either an owner occupier or indeed an investor looking for an immediate return. This property has the benefit of being owner-occupied and is in absolute mint condition. I am expecting keen interest and would advise arranging a viewing without delay." Viewings of No 1 Estoria House can be arranged by calling DNG Maxwell Heaslip & Leonard on 091 565621.